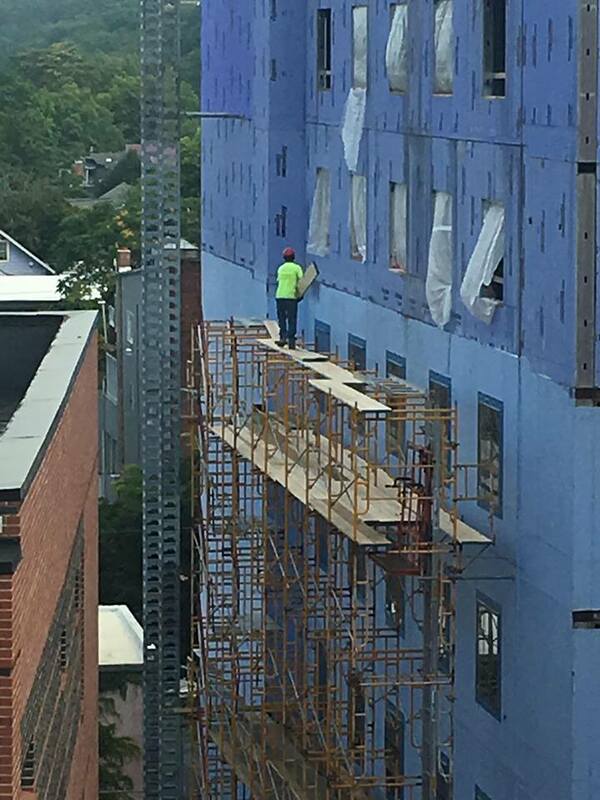 If you’re on social media in Tompkins County, you may have seen a Facebook post with a LOT of community commentary on the dangerous situation of a worker laying scaffolding some 5-6 stories up at the Hilton Canopy Hotel construction site without a guardrail, harness, or firm decking in place. Since the post, the Ithaca Voice and 14850.com have done important stories on the situation. [See picture to immediate right from Friday, August 17th, as provided by a TCWC Member.] The hotel is being built on the 300 block of E. State Street in Ithaca, on the same side of the street of Viva Taqueria. The Tompkins County Workers’ Center shared the above information with the Occupational Safety and Health Administration (OSHA) office in Syracuse on Monday, and then again on Tuesday when a TCWC Member shared video, which can be seen by clicking the picture immediately to the right, or at the bottom of this post. At this point, the general contractor, William H. Lane (WHL) Inc. of Binghamton, and the subcontractor, CFI Sales and Service in Brackney, PA, both state that the worksite practices are fully compliant. OSHA has up to six months to render a decision on whether the situation viewed in the above picture is compliant with OSH regulations or not. OSH regulations, of course, are a bare minimum: we can always find ways to go above and beyond to make work as safe as we can. are some of the many situations we’ve heard from workers. We provide training and support so that people can becomes their own experts in their rights and also how to identify, think about, and control workplace hazards. Would you like to learn about more about your rights and your employer’s obligations to provide a Safe and Healthy workplace? Are you interested in learning how to identify hazards at work, how to create strategies to eliminate or control them, and organize to make change? The Tompkins County Workers’ Center does workplace Safety and Health training for groups of workers — from the same, or different workplaces — for exactly that. They are free. Contact Carlos Gutierrez at carlos@tcworkerscenter.org or 607-269-0409. If you didn't see my post from Monday of a worker in a very dangerous situation working at the construction site of the Hilton Canopy Hotel development in downtown Ithaca, get ready for THIS video just shot by my 'source' as of 10:45 a.m. TODAY. OSHA has been notified, as of Friday, Monday, and now today. Look for worker close to top of building in orange. [Yesterday's post is here: https://www.facebook.com/pete.meyers/posts/10156709885548255]Would you like to learn about your rights and your employer's obligations to provide a Safe and Healthy workplace? Are you interested in learning how to identify hazards at work, how to create strategies to eliminate or control them, and organize to make change? The Tompkins County Workers' Center does workplace Safety and Health training for groups of workers — from the same, or different workplaces — for exactly that. They are free. Contact Carlos Gutierrez atcarlos@tcworkerscenter.org or 607-269-0409.